The easiest workout is walking. It is said that every person should walk at least 10,000 steps a day to remain healthy. With the aid of Runtastic Pedometer PRO app for Android, now you can count your steps precisely so that you always know how nearer – or farther – are you to your fitness goals every day. 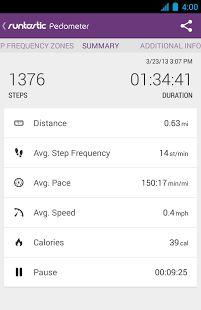 You can get Runtastic Pedometer PRO Android app for $1.99 from Google Play Store. What Runtastic Pedometer PRO app for Android does is simple. Whether you’re walking, hiking, or backpacking for pure enjoyment, to improve your general health and fitness, or as part of a specific diet and weight loss routine, the app counts every step you take and helps you reach your workout goals. It counts your steps, distance travelled, speed, calories burned and other statistics involved. Another plus with Runtastic Pedometer PRO app for Android is that it works from anywhere. You can place the phone in pants or jacket pocket, hand or arm, in a sports bag or purse, but your app precisely count your steps. Further, it helps map your workouts in real-time with built-in GPS and monitor your progress. You can also look back and analyze the last 5 walking activities on your phone. Of course, it is a well connected world out there, and Runtastic Pedometer PRO app for Android seems to understand that fully. If you want to share your fitness activities with your friends, you can do it via social network sites such as Google+, Facebook and Twitter. Runtastic Pedometer PRO is compatible with the Runtastic fitness site, runtastic.com, where all your data will be managed. The app is designed to work with phones running Android OS versions 2.2 and up. Runtastic Pedometer PRO app for Android helps you view the workout element of your daily walk in perspective by counting the steps or the calories you burn in the process. It works anywhere – in your pocket, bag or hand – so that you don’t have to worry about where you keep the phone as you walk. SNS integration helps you share your fitness activities online. The UI is easy to use for most parts. Verdict: Check it out if you love walking, as a means of exercise or plain fun.